Menlo School is an independent, coeducational, college preparatory school for 795 students in grades six through twelve. Established in 1915, the School is dedicated to providing a challenging academic curriculum complemented by outstanding creative arts and athletic programs. Menlo helps students develop positive values and nurtures character development in a supportive environment that upholds the highest moral and ethical standards. Our program encourages students to reach their fullest potential and to develop the skills necessary to respond intelligently and humanely to the complexities of a diverse and increasingly interconnected world. We frequently talk about the “Menlo Mind”: the element of a student that enables her to see her school experiences in the context of the world ahead, to live in the moment, to play on a team, to sketch a picture of love or fear, to feel true joy—it’s the ability to connect and grow. We think learning is fun. When the going gets tough, we know just what to do. Build a team. Work hard. Laugh along the way. We believe we can rise to any challenge—in the classroom, on the field and on the stage. We’re people you can count on. We find quiet moments to reflect and recharge. We notice when diverse points of view are missing, and we seek them out. We’re curious about many things and are happiest when we can explore. We want to do everything we can to make the world a better place. Engineering teacher Joanie Banks-Hunt in the Arthur Allen Whitaker Lab. The Arthur Allen Whitaker Lab is a large, open space with high ceilings in which engineering, applied science, robotics and biotechnology classes, as well as independent student projects, take place. A wall of windows opens into the main area, the center of which is filled with movable workbenches, so that the space fits the students and projects, not the other way around. From the ceiling hang electric plugs and compressed air hoses; gas outlets are available throughout the room. Around the edge of the room are banks of computers, a microcontroller area, and common areas for measurement, testing, soldering and electronics. There are two 3D printers, one industrial grade and one a maker bot for general use and prototyping (two older 3D printers are also in use). A tool shop room, which can be locked separately, includes a miter saw, skill saw, table saw, band saw, drill press, disk and belt sander, along with a welding station, a 75W, 24 x 18 in. Epilog laser cutter and three 220V plugs. A smaller open space for robotics includes a competition arena (built by a student), computers and robotic parts and tools. We are one of very few secondary schools in the country to have an Atomic Force Microscope. Finally, a conference room allows for presentations and meetings. Testing a motor in the lab. The Applied Science and Engineering program began 10 years ago. During that time, we’ve done a lot of thinking about what skills a successful student should have when they leave Menlo. We call our space a lab, not a maker space, because this matches our philosophy more accurately. While it is important to make things, use the tools and have fun, we really focus on teaching the students to make intelligently: design, prototype, analyze, build, analyze, rebuild, present. All of our students gather data on their projects to enable them to build smarter and learn why something didn’t work. From analyzing failure comes true learning and success. We also stress optimization. It is not enough to build an electric motor that spins. You must optimize it by taking data (using oscilloscopes and current transducers, for example), and then redesign smarter. Our students learn CAD (Inventor or SolidWorks), how to give engineering and science research presentations, and how to write research papers (many of which are published in the school’s journal of student scholarly work, The Roundtable). The papers in particular are an incredible learning opportunity. We help them to learn the science and engineering behind their project: What’s inside a transistor, how does it work? What exactly does a microcontroller do and how? What is a scintillator and photomultiplier tube? We have a “no black boxes” policy. We don’t even allow photogates. Instead, they hook up a red laser to shine into a photoresistor. They make a voltage divider circuit and attach the oscilloscope (this is how they measure the rpm of their motors, for example). In their papers they explain how everything works and analyze their data and mini experiments. Most importantly, not everyone and everything is 100% successful. But we teach our students to always learn from the mistakes, which increases the probability of success in their next iteration, their next project and throughout their career. We celebrate and learn from failure. We appreciate success and study how it could be improved or done differently next time. There are many classes that use the space, some for the young (Mechanical Engineering, Electrical Engineering), some lasting just a semester so a kid can dip their feet in (Engineering), and some advanced classes (Applied Science Research, Biotechnology). The Menlo’s Bridge to Engineering, Science and Technology (M-BEST) program fosters girls’ enthusiasm and passion for STEM fields, developing a community of learners and providing a network of female professional role models; they frequently hold all-day workshops for students grades 6-12. Students from all grade levels may also use the space to pursue independent study or develop a project on their own. We also invite students from local underserved communities to the lab, and Menlo students will serve as mentors and guides. All students in Applied Science Research create a balloon launch that goes to near space, though the goal is not merely to send the balloon as high as we can. They have to design and program their data acquisition from an Arduino and sensors from Digikey. We teach them how to order, read a data sheet and put it all together. They test everything before going to space (using vacuum chambers and temperature chambers). They also calibrate their own sensors using pressure, temperature, humidity and other standards (using Extech devices that are not true NIST standards but are much more accurate than the Honeywell sensors from Digikey). This way they attack the experiment is just as real scientists and engineers do. Students also have to figure out how to track the balloons, as they go well over 100,000 ft. into the air. They program radio and GPS chips and get them working with an Arduino and HAM radio. 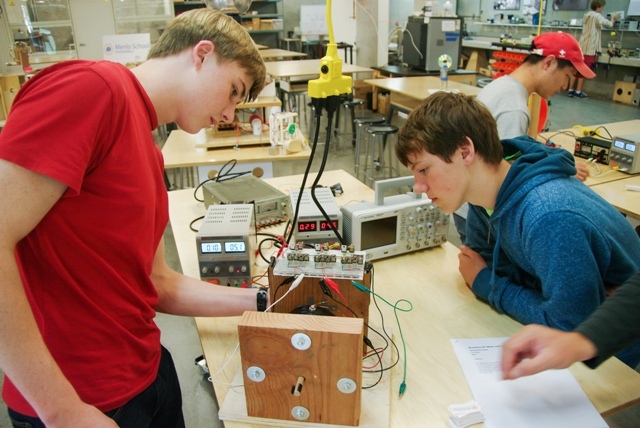 Through independent or group projects, students have also built a thermoelectric generator system, a signing Tesla Coil, an autonomous parallel parking car, a quad copter, a monowheel, a power-generating windmill, a electric car (using the shell of an old VW bug) and a self-contained 7×7 LED Cube. A middle school girl built and coded from scratch a voice modulator to use with her Halloween Darth Vader costume. Robotics students build and code LEGO robots and enter the FIRST Tech Challenge competition; Menlo teams have reached the state and national levels of the tournament. These are just a few examples of the wide range of projects that are born in the lab. The Atomic Force Microscope has been used by a student to examine what happens to life in the San Francisco Bay when sea levels rise. She hypothesized that as levels rise, the intensity of light reaching plant life will decrease and cells will suffer damage, and she placed sea lettuce in aquariums with light filters that mimicked different light intensities. By using the AFM, she can study the plant cells at the 1 micrometer level to determine the health of the planet. Freshman Physics classes also study the actual design of the AFM and the theory behind it to learn about optics. Each year, students show off their projects at the “Menlo Maker Faire” on campus, and then at the Bay Area Maker Faire. As new technologies appear, we’ll update our tools so that students are working with the same materials that working scientists use. We plan to create even more opportunities for our youngest students to work in the lab and to build relationships with more students from local communities. We’re working on ways to incorporate the arts; visual art students have already used the lab to create sculptures, including kinetic sculpture. Math and computer science classes are beginning to use the space as a teaching tool, and we hope to expand that work. Lab Director: Dr. James Dann, james.dann@menloschool.org.